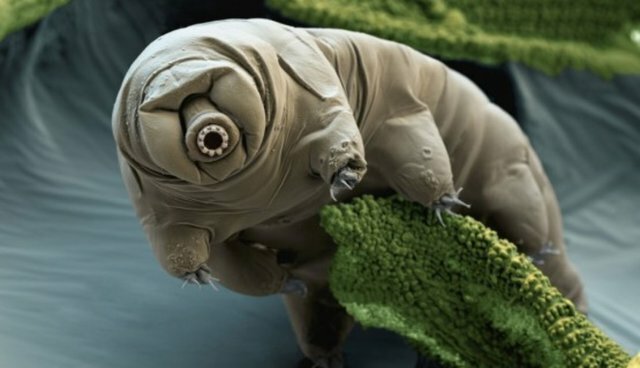 Water Bears: The toughest critter on the planet? Here's something to think about. Who will still be here once even we humans have gone the way of the Dodo? Well, there's a solid chance that it may be the mighty little Tardigrade, or Water Bear. Tardigrades thrive most everywhere on earth, and even in outer space. Although over 1,000 Tardigrade species waddle around our planet, you'd never know it because most of them are only around 1 mm in length. Thriving most everywhere on earth – from Antarctica to the Amazon, and from the top of Mount Everest to the Challenger Deep, Tardigrades can withstand up to 6,000 times the atmospheric pressure at sea level, or about 6 times more pressure than the squeeze at the deepest point in the ocean. These little guys can survive temps from -475 degrees F to well over the boiling point of water. They can lie dormant for up to 100 years, and be revived by only one drop of water. Direct exposure to ionizing radiation won't phase them either. Tardigrades can survive as high as 500,000 rads of ionizing radiation. FYI, a dose of 1,000 - 2,000 rads is fatal to humans, and we suffer significant damage with much lower exposures. In 2007, the European Space Agency launched a spacecraft full of science experiments. During the mission, the Water Bear astronauts prevailed over sub-zero temperatures, unrelenting solar winds, cosmic radiation and an oxygen-deprived space vacuum. And although humans have about 90 seconds in those conditions before we're toast, the Water Bears didn't mind, they just went about their business and laid eggs!